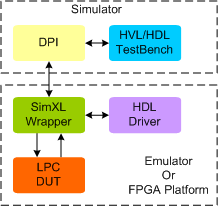 LPC Synthesizable VIP/Transactor provides an smart way to verify the LPC component of a SOC or a ASIC in Emulator or FPGA platform. The SmartDV's LPC Synthesizable VIP/Transactor is fully compliant with standard LPC Specification and provides the following features. Compliant to LPC 1.1 specifications. Supports bandwidth up to 33 MHz. Host is capable of generating all types of LPC transactions. Peripheral is capable of responding to all types of LPC transactions. Supports Wakeup and Power state transactions. Supports insertion of various types of errors.